Sinai residents have reported to Ahram Online that heavy machinery of the state-owned Arab Contractors company is being used to destroy tunnels linking Egypt and the besieged Gaza Strip. The destruction of the tunnels is happening under the supervision of Egyptian military forces. 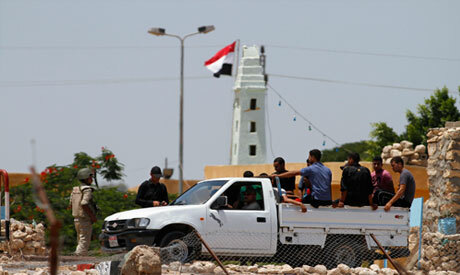 The move comes after 16 border guards were killed Sunday by as-yet unidentified assailants in an incident that laid bare security problems in the Sinai Peninsula. Hamas leader Mahmoud El-Zahar confirmed that the Egyptian military was closing the tunnels and would abort any attempt to build new ones. The tunnels between Gaza and Rafah were previously used to transfer food supplies and other goods. Gaza has been under an Israeli-imposed blockade since 2006. Egypt's support for the blockade under Hosni Mubarak was a controversial issue contributing to popular ire against the former regime. Egyptian authorities on Monday announced the closure of the Rafah Crossing.